Hello! I'm back from my trip to Whistler, British Columbia, from which I have been spoiled, coddled and pampered. No cooking, no dishes, no laundry. 1. Having a room on the 6th floor of the Four Seasons providing a great view. 2. Heavenly bed and pillows that brought sleep quickly. 3. Huge walk-in closet with his and her sides. Yes! 4. A daily newspaper delivered every morning at my front door. 5. Able to kick up my heels in front of the fireplace and sip coffee, watching early bird skiers shuffling towards the slopes. 6. A lobby with overstuffed sofas and attentive staff. 7. And rustic impressionistic tree limbs that border the lobby, bringing the outside in. Feng shui done well! 8. A room like this to write in while The Professor goes out and tears up the slopes. Why oh why doesn't my writing room look like this? 9. After a day of skiing, you could grab a robe from your room and take a dip in their luxury spa. Fortunately for all the other guests, I left my swimsuit at home. 10. Have someone like The Professor to sweetly carry your skis. 11. Have someone like The Professor who knows, that skiing these slopes, my quads would be screaming by the end of the day. 12. Never have to be near signs that said "Avalanche Prone Area." The Professor, who can reach areas like this, took this shot on top of the mountain. 13. Because when he was up here on top of the mountain, I was down there at the bottom of the mountain in the village. Pampering myself. 14. Because I really don't want to take a ride with these guys. 15. Nor do I want to ride in this! 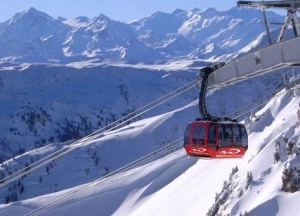 This is the Peak 2 Peak gondola that runs between Whistler and Blackcomb mountains. A 2.7 mile crossing with the valley nearly 1,500 feet below, one of the longest vertical drops in North America. No way was I getting in that tin can. Those things can come crashing down sometimes, you know! And then for sure I'd be riding in one of these. And then we are talking a whole other way of being spoiled, coddled and pampered. And I much prefer the pampering of the Four Seasons! Yowsa. I like your idea of pampering. I have to settle for a spa treatment here and there when I can get one. Yeah, no. I would have been with you in that nice hotel, and not out there in those...elements.